Donuts. Doughnuts. Doughnettes. However you spell it, after my nephew’s laughs or hanging out with my husband, I don’t know if there is anything that makes me as happy as a fresh donut. No matter where I am traveling, I’m always investigating if there is a donut shop nearby. I have been known to drive out of my way or plan an entire day around donut consumption. Crullers, long johns (which I can only find back in Ohio :( ), cake, yeast, cronuts, jelly filled, glazed, sprinkled, baked or fried, I’m an any and all donut kind of girl (except for Dunkin’s which I know is sacrilegious in New England). Old fashioned mom and pop bakeries, whose longevity shows their skill are usually what I gravitate towards. The cash only places where you share the counter with regulars whose orders are known when they walk in the door and where you can get a baker’s dozen for under $10. These are my people. But I am loving the donut renaissance that has overtaken the US in the past few years. Craft, handmade (and usually much more expensive donuts) have popped up all over the place, some very worth the accolades and money and others, well not so much. 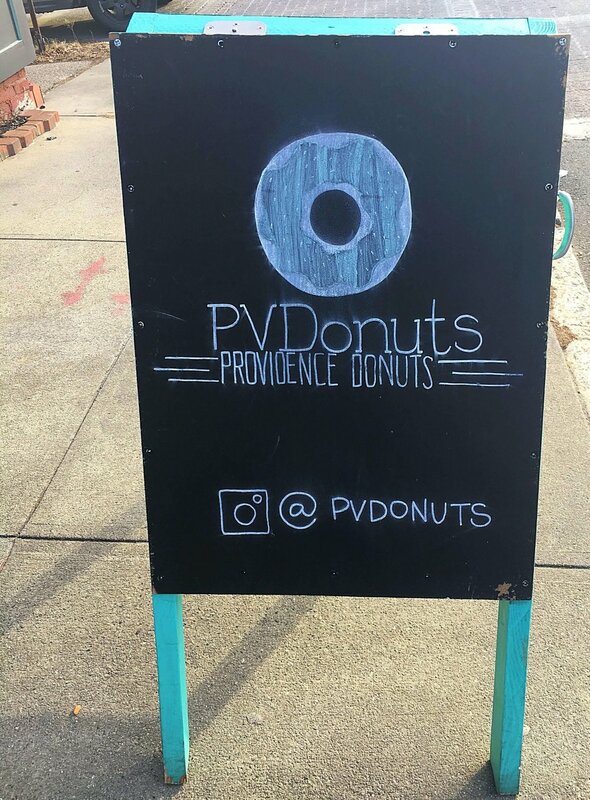 I’m happy to report one place that is definitely worth the hype and the drive out of your way is PV Donuts in Providence, Rhode Island. Oh. My. God. They know what they are doing. It is evident by the fact that they sell out practically everyday. I cannot stress enough that you order in advance - very easy via their website. After finding a parking spot out front (no lot - just street parking), we strolled in at 2:30 to find there was just one kind of donut left on the shelves. Luckily, I had ordered (less than the 24 hours they requested but they were still kind enough to accommodate me) and had my donuts ready to go. They had a large selection of coffee too but not being a coffee drinker, I chose to pair some ice cold milk with my donuts. The menu changes monthly which makes for a great excuse for return visits. Some varieties are available only on certain days - be sure to check the menu in advance on their Facebook page. We ordered a variety donuts: brioche yeast, cake and old fashioned donuts (they also carry vegan and crullers). A buckeye old fashioned (me being from Ohio that was a must), a brown butter sugar cookie old fashioned, a hot chocolate brioche and a gingerbread cake. The old fashioned and cake donuts were moist and the toppings rich. These aren’t your average little donuts - these are a donut meal. You could see the detail in the toppings and taste the perfect mix of flavors in each bite. The brown butter donut, with its own mini sugar cookie, was the winner for me. The yeast donut (hot chocolate) was one of the better I have had - the chocolate was very rich - in a good way. I find a lot of yeast donuts, especially those done by newer bakeries, are usually too doughy but I found PV Donuts brioche-topping ratio to be well balanced. 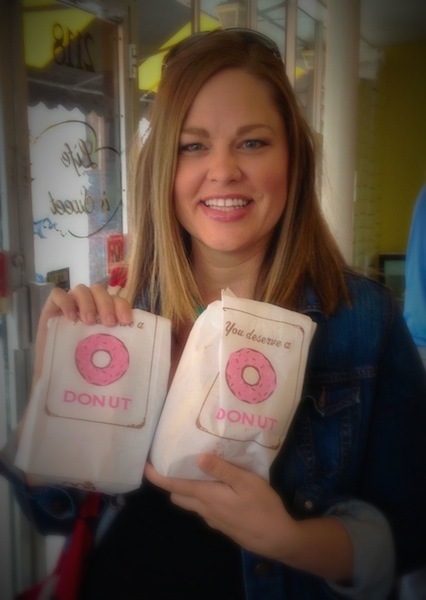 Even my husband, who frequently rolls his eyes as I wax poetic about donuts agreed that the donuts were worth the drive. The care and creativity can be seen and tasted in each donut. The bakers arrive at 2 in the morning to craft all the donuts of the day and their commitment is evident when you open your stamped brown box to see the mini works of donut art that await you. They are almost too lovely to eat. Almost. Get yourself to Providence ASAP.